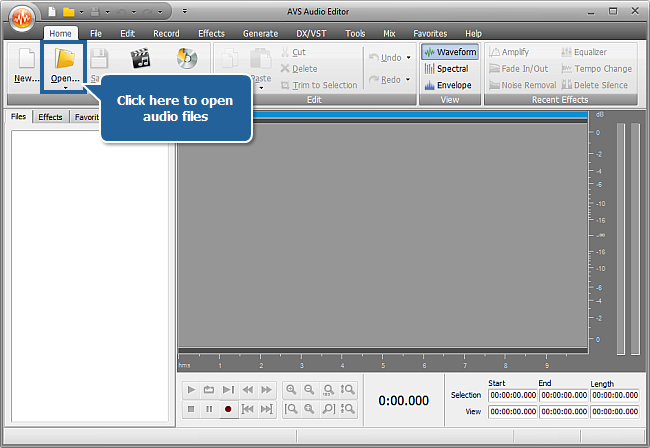 How to use audio effects in an audio file with AVS Audio Editor? You have an audio file you want to correct or modify? So, you need a program which supports various audio formats and includes several types of effects and filters. 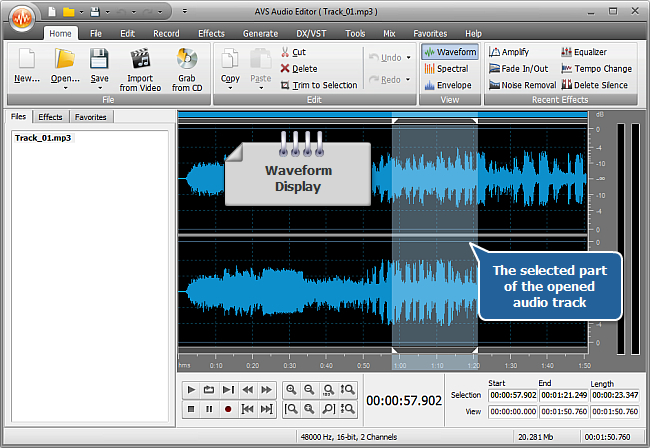 AVS Audio Editor will help you to achieve this goal. To open an audio file for editing click the Open button on the Home tab of the Ribbon Command Bar. 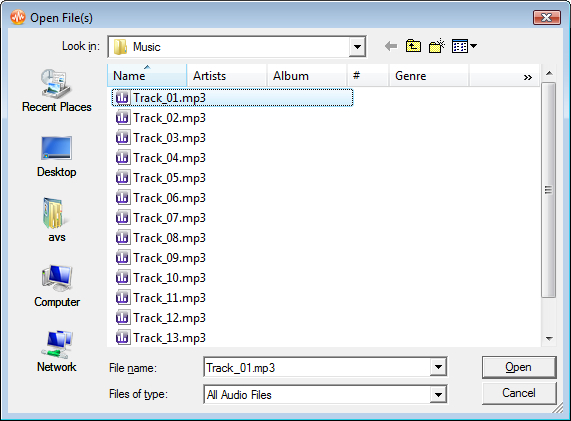 In the opened Windows Explorer window browse for the necessary audio file. You can apply an effect to the whole file or modify just a part of the track. To select an area where you want to add an audio effect click within the Waveform Display and, without releasing the left mouse button, move the cursor to the left or right to make a selection. Switch to the Effects tab and select an appropriate effect. 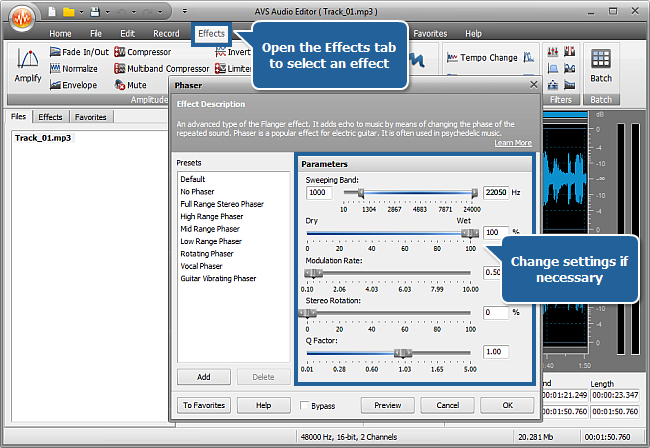 The AVS Audio Editor program offers a wide range of audio effects, please click here to learn more about available effects. Click the effect button to read the description of the effect and to change its parameters. You can select one of the available presets from the list or define the parameters according to your needs. Use the Preview button to make sure that the changes are correct. To quickly compare the processed audio with the original sound check the Bypass box and press Preview - you'll hear the sound without the effect. Click OK to apply the changes or Cancel to discard them and close the dialog window. Save All to save all the changes to all the edited files. The program can change the format of the edited file when you save it. Click here for more detailed information on the saving options. 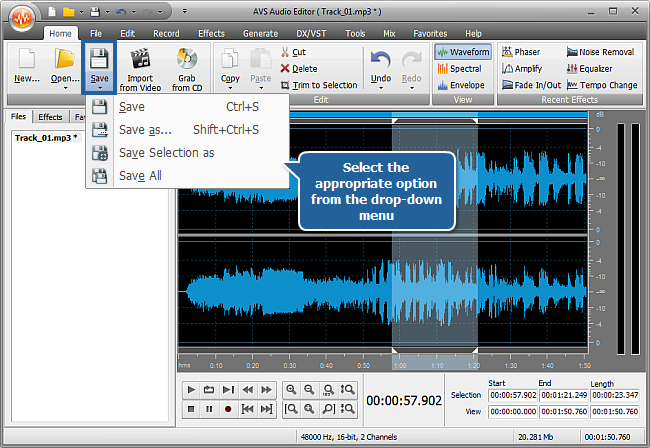 Now you know how to apply effects using AVS Audio Editor. Use all the functions of the program that will surely help your imagination work miracles!